The prize comprised of mini Organic Deep Cleansing Balm, mini Organic Moisturiser, mini Organic Scratchy Balm and the star of the show (for me), a full sized (30ml) OMG (Organic Miracle Goddess) Serum. Now, a bit of background. During my teens and twenties, I suffered (first world problems!) from fairly oily skin. Spots were common, and the battle against ‘shine’ was constant. During that period of my life I would have recoiled in horror at the thought of putting oil of any type on my face, but at some point during my thirties that’s exactly what I did. I was persuaded to try an expensive, fancy facial oil by a very convincing sales assistant in some smart department store. I kinda liked it. I was surprised by how good it felt on my skin (which by this point had edged towards the middle of the skin spectrum, and was probably kind of ‘normal’). But for some reason I never finished that bottle. Guess I didn’t like it that much eh? These days I think I’m reaping the benefits of that oily skin early on as I have relatively few wrinkles for my age (though looking at my mum, genetics have played a part in that too). But, now that I’m in my mid *cough cough* forties, I definitely feel that my skin needs a little extra help. I’ve used the same popular, mass produced day moisturiser for a few years, but rarely get around to using any night time products as, to be honest, I don’t really have a night time routine other than a quick wipe over with one of those cheap facial cleansing wipe type things <Blush> (To be honest, my regular morning routine isn’t generally any better – I use a facial wash in the shower, then apply, without fail, a slather of moisturiser). All this preamble is my way of saying that until recently I didn’t really ‘do’ skincare products, and was unconvinced as to their efficacy. Well that sure has changed. And what was it that changed my mind I hear you ask? If you guessed it was one of Lisa’s products, you’d be right. I have fallen utterly and totally in love with her OMG Serum. OMG Serum is made from a careful blend of 7 natural oils and butters, and fragranced with nothing more than pure essential oils. That’s it. It’s 100% natural and 99% organic. It’s supplied in an airless pump, which makes dispensing completely mess / spill free, and removes the need for an added preservative (as bacteria cannot transfer from hands to the product). When I first started using the serum, about 6 weeks ago, I used one single pump worth, once a day. It (unsurprisingly!) has an oily texture as it goes on, gliding silkily over, and into, the skin. For that reason, in the early days, I tended to avoid using it in the morning as I wasn’t too sure how my tinted BB cream (I don’t use foundation) would fare on top of it. However, a couple of weeks in, I realised that the serum was absoutely not sitting on the surface of the skin. It was being completely absorbed, leaving no trace of ‘shine’ on my face. This was a revelation. I tried applying my BB cream about 10/15 mins after applying the serum. Still no shine. Happy days! Since then I’ve been using it after my shower/facial wash routine every morning. I cannot overstate how good my skin feels these days. It’s perfectly moisturised all day (I don’t use the mass produced moisturiser any more) and looks healthier, plumper, softer, more elastic. This morning, I applied the serum (two pumps a time these days folks, just because…), waited 15 mins, brushed on the teeniest bit of transluscent powder, and off I went. That’s how good my skin is these days. Let’s talk hard figures. OMG Serum retails on Lisa’s website for £17.95 for 30ml, and should be used within 6 months of opening. I reckon I’ve used about 1/8 of it so far, but of course I’m using much more of it now than I was in the beginning, so I reckon there may well be about 6 months worth in there. If there’s less, it won’t be much less, and if there’s more, well I’ve never worried TOO much about use by dates, so if it lasts me 7-8 months, I won’t worry too much about it. So assuming one uses approximately two 30ml containers a year, that’s £35.90 a year for the most amazing results – an absolute snip! (And I just checked – that fancy pants facial oil that I tried years back? Retails for £33 for 30ml today, and it’s nowhere near as good, take my word). For those cynics out there (I know you’re there, I’m one myself :-D) please be aware that although I didn’t pay for this product, I won it fair and square in a prize draw (check out the post on the 31st Jan on her FB page) and at no point has Lisa asked for my opinion on it, or asked me write a review. I’m simply a total convert, and will be buying more when the time comes. If you’d like to know more about the OMG Serum you’ll find it here on the LJ Natural website. You can follow LJ Naturals on Twitter and Instagram. Thank you Lisa for an amazing prize! Oh, and I nearly forgot, the mini samples were fab too, but as you already know, I’m a bit crap with the whole cleanser / toner routine <blush again>. I’m tired tonight. It feels like it’s been a long and busy week, and now, not even 9pm on Sunday night, I feel ready for bed. So I’m going to make this brief, and then tackle the ironing pile before bed. Oh, the glamour!! I also spent a bit of time working on the packaging and labels for the bombs. I think I have a solution, though I’m not quite ready to share photos yet. Maybe next week. I’m very happy to announce that as of March I’ll be supplying a brand new retailer, Sunnah Skincare who have a store at 88 School Lane, Didsbury, Manchester. This Skincare Co-operative was set up, and is run, by women in the local community, and their aim is to trade as fairly, responsibly and ethically as possible. Check out their Facebook and Instagram accounts. Well, that was longer than I’d planned for it to be. If you got this far, thanks for reading. Back soon! Fact is, you only need THREE ingredients to make soap. A vegetable or animal fat of some kind, sodium hydroxide (NaOH) (aka Lye) and water. 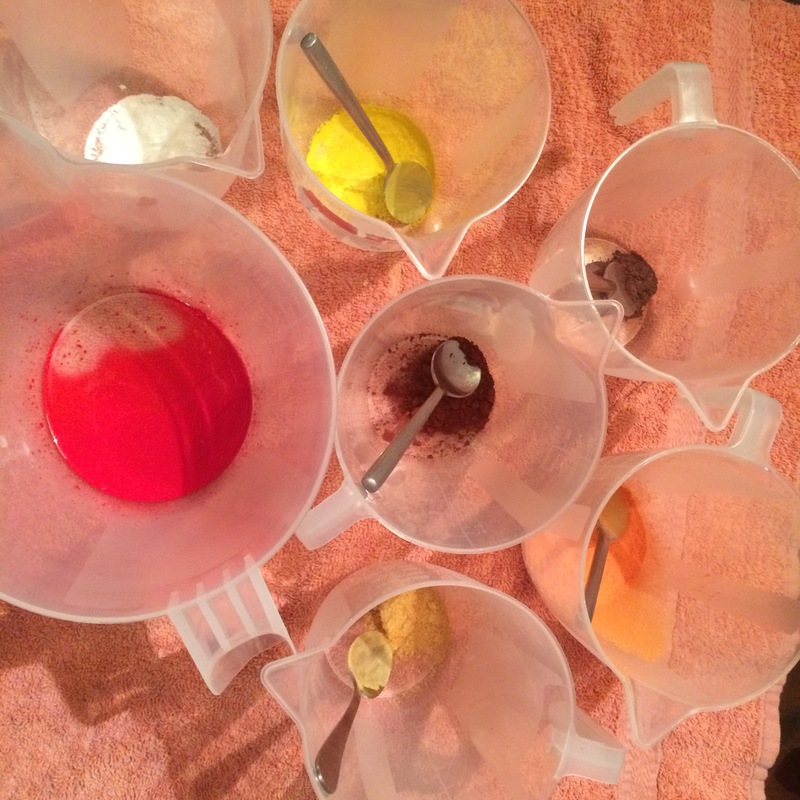 The sodium hydroxide is combined with the water to create a lye solution, which is then mixed with the oils or butters. The sodium hydroxide combines and reacts with the fatty acids in the oils and/or butters and hey presto, you get soap, (plus, by the way, glycerine. I’ll come to that later). Sodium Olivate, Sodium Cocoate, Sodium Shea Butterate, Sodium Avocadoate, Sodium Cocoa Butterate, Sodium Castorate, Glycerine, Aqua, Salvia sclarea (Clary) Oil (Sage essential oil), Cymbopogon schoenanthus Oil (Lemongrass essential oil), Activated Charcoal, Titanium Dioxide (Ci 77891) & Micas *linalool *citral (*naturally present in essential oils). All my bars contain six different oils and butters: Olive Oil, Coconut Oil, Shea Butter, Avocado Oil, Cocoa Butter and Castor Oil. Bear with me here – small chemistry lesson coming up. If the soap is made properly, there will never ever be any sodium hydroxide present in the final bar, and so it isn’t necessary to put it on the ingredients label. However, the sodium hydroxide has caused the oils and butters to change – into soap – or, chemically speaking, into ‘salts’. This is why the first six items on the ingredients list are all ‘Sodium (insert name of oil)ate’ ie, they are all salts formed from the original six oils/butters combined with sodium hydroxide. So why those particular six oils and butters? I use coconut for it’s ability to give soap a great, abundant lather, but it can be drying to some people’s skins and so I temper it with plenty of olive oil which produces a mild, gentle soap. Cocoa butter contributes to the hardness of the bar, whilst also being moisturising. Avocado oil and shea butter are considered to be luxury additives – they don’t contribute to the lather or the hardness of the bar, but they are extremely moisturing. They’re probably the reason my customers say they don’t need hand cream after washing with my soap! 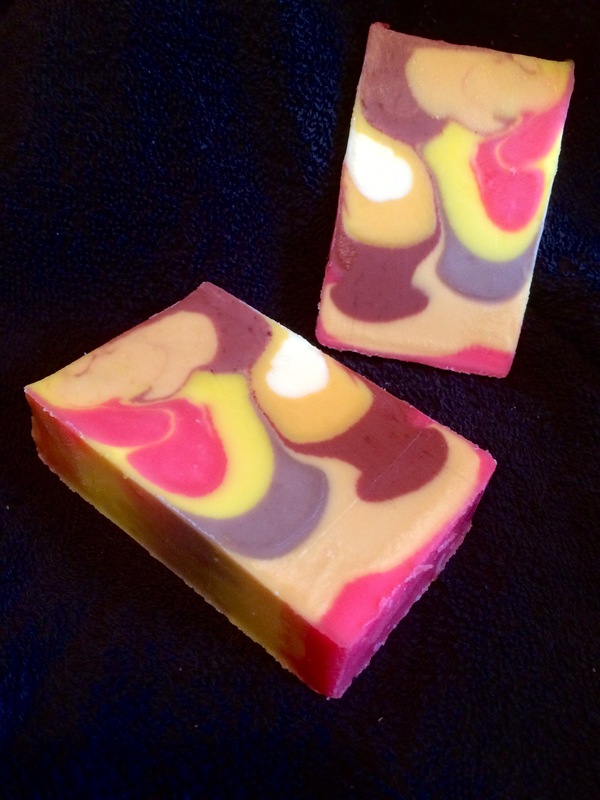 I decided long ago not to use animal fats in my soap. I don’t have a problem with animal fats per se – I’m not vegetarian, and I know from my early days of soapmaking and experimentation that lard makes wonderful soap. It was just a decision I made early on in my recipe development, and I’ve stuck with it. Similarly with palm oil, I used it in my early soapmaking, but haven’t done for years. I have no problem with other producers using palm oil – each to their own – but it’s not for me. Next comes Aqua (water). Water is needed to create a solution of the NaOH. That’s its only purpose. 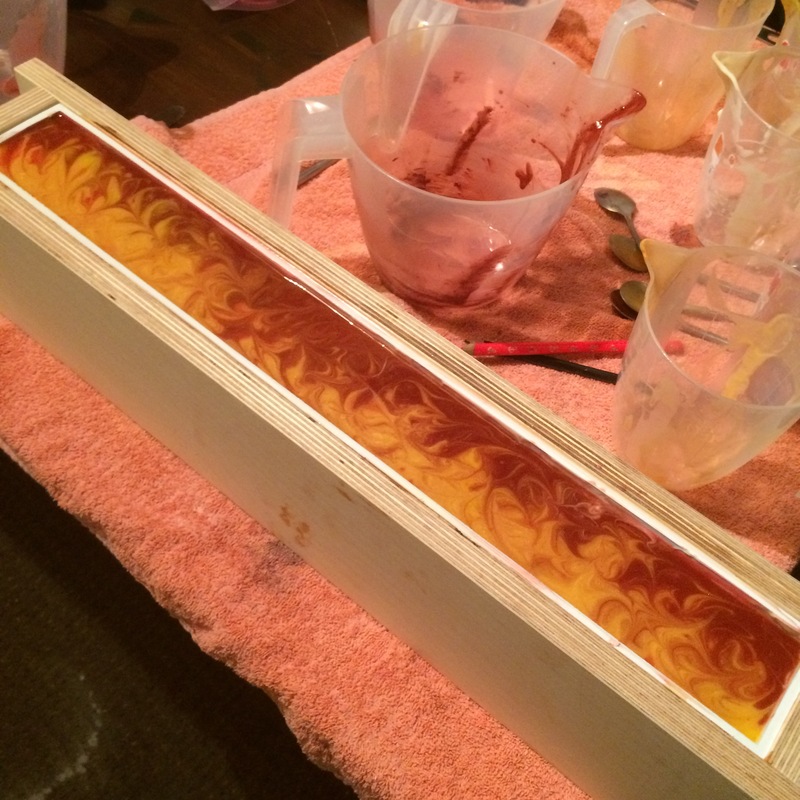 Once the soap is made, we soapmakers leave the soap to cure for weeks on end, drying out the soap and trying to get rid of as much of the moisture as possible. 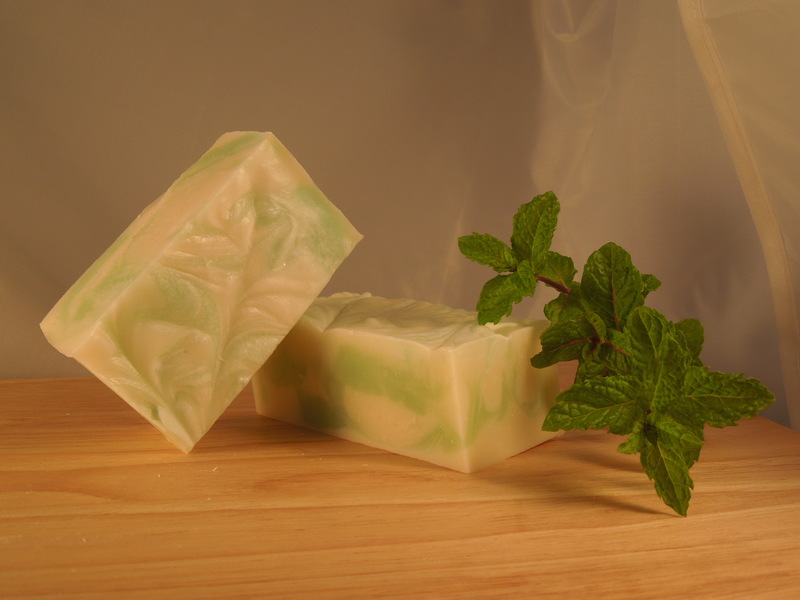 The next two items on the list are simply the fragrance – Sage essential oil and Lemongrass essential oil. Some soapmakers claim that essential oils added to soaps have therapeutic properties above and beyond the fragrance, but there is some doubt as to where these properties survive the chemical process. Anyway, without extensive and expensive laboratory testing, making such claims is misleading. The next three ingredients – Activated Charcoal, Titanium Dioxide (Ci 77891) & Micas – are colourants. The first two are natural, the mica has colour added to it in a lab, so can’t be considered natural. Finally we come to the last two starred items: *linalool *citral (*naturally present in essential oils). The EU Cosmetic Regulation 1223/2009 lists the 26 most allergenic (ie most likely to cause an allergic reaction) substances and states that if your soap (or other wash off product) contains more than 0.01% of that substance then it needs to be declared. Many essential oils contain one or more of these substances, and it’s very rare that they cause any problem whatsoever. But rules is rules :-)! Thanks for reading, I’ll be back soon! If you have any questions about my ingredients, or anything else for that matter, please comment below. Where did the week go? The first week of January has come and gone, and it’s time for me to get back into the habit of weekly updates – it’s been a whole month since I last did one of these! I had this crazy idea that I’d try the Thermal Transfer method for the OMH, and as I could have predicted had I thought about it for longer than a couple of seconds, it didn’t go so well (keep an eye out for another post on that little adventure very soon). These have now been cut but I’ve not got round to taking any photographs yet (and to be honest, I’m not sure I want to take photographs of the OMH – seriously, it’s a bit of a hot mess…) but there’ll be some up on my Instagram (@thesoapmine) account soon enough. Tonight I made another three batches. The left hand one is a brand new (to me) Fragrance Oil called Flora, which I’ve done in white, yellow and green (thoughts of spring already…), then we have restocks of First Kiss and Clarity. 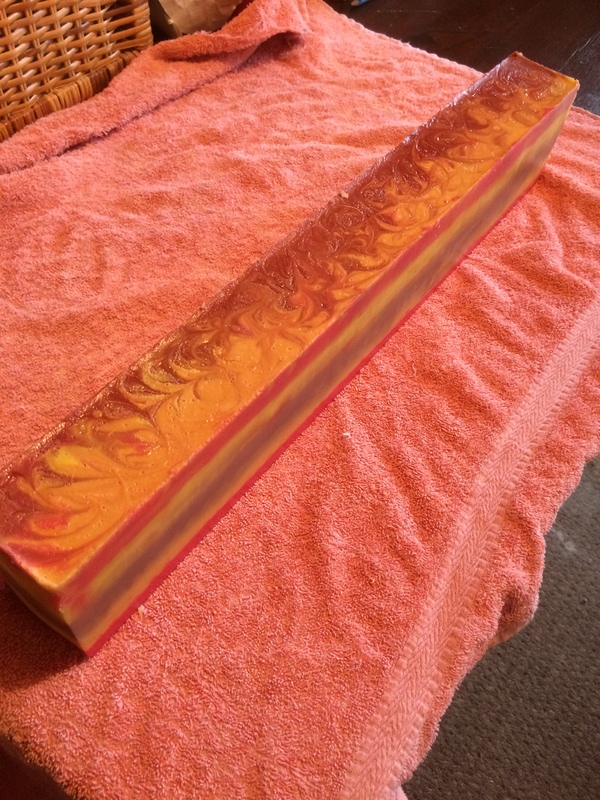 In other news I’ve confirmed a new customer with a sizeable order for my mini guest bars, and I’ve taken a booking to do one of my soap talks in a few months time, so all in all it’s been a productive week. Hope you’ve all had a great week. Thanks for reading – back soon! I knew it was coming, but I stuck my head in the sand and told my myself everything would be ok. Well of course it is, and it will be even better, but flipping heck it’s having a major effect on daily life!! Needless to say I’ve not had much of an opportunity over the last few days to just sit and write, so here I am, again, with just 63 minutes of the day left, determined to get Blogtober Day 20 out before midnight. Fortunately for me, today is Thursday, so I can do a little #throwbackthursday post. Wake Up! 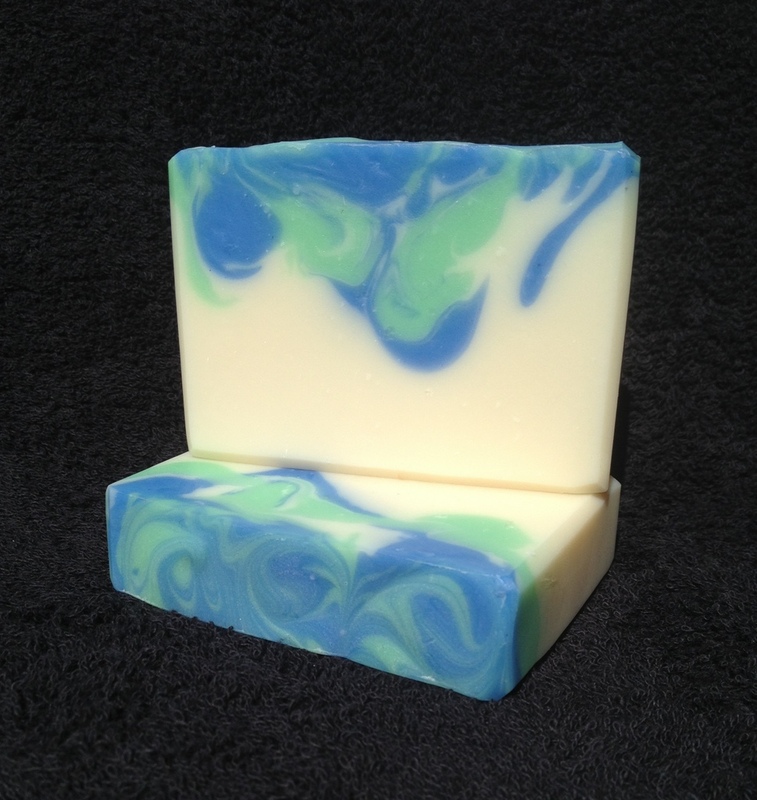 was the first soap that I ever made using a blend of essential oils, way back in early 2010. Up until then I’d used fragrance oils in soap but, despite having an interest in aromatherapy, I’d never tried blending oils myself. Oh how things change! It’s a simple but refreshing mix of Peppermint and Rosemary essential oils – perfect for waking up the senses in the morning shower. While the fragrance blend has stayed the same since that time, it was a couple of years before it got its true name. Up until some point in 2012 it went by the predictable, if uninspiring, ‘Peppermint & Rosemary’. 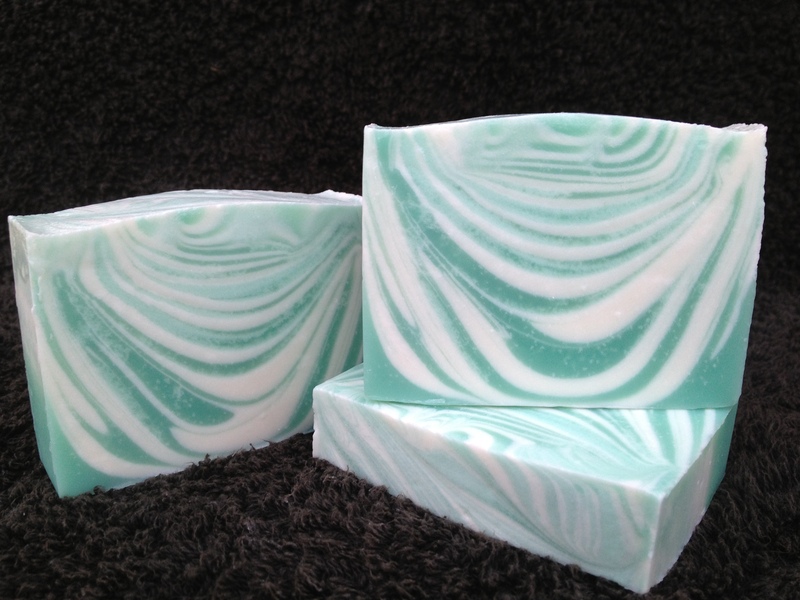 1st incarnation of Peppermint & Rosemary – now known as Wake Up! I quite like the sprig of mint used there as a prop, but the least said about the background the better! 2nd incarnation of Wake Up! Interestingly, it’s only now that I realise that I hadn’t started bevelling the edges at this point – something I always do these days. 3rd incarnation of Wake Up! 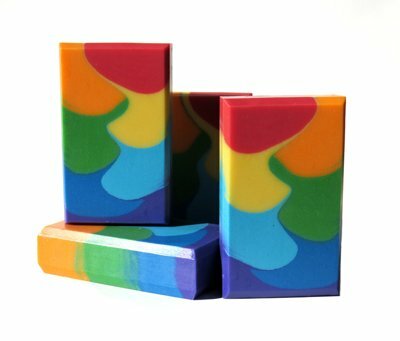 Currently all my essential oil soaps are made using the Drop Swirl technique, as I wrote about here. Sometimes they have textured tops, sometimes mica swirls, but they are always (for now!) Drop Swirls. I’m really enjoying looking back over old designs, so please bear with me in the short term while I indulge myself with these makeover posts – I will try to intersperse them with some other stuff as well 😀 Thanks for popping by!